Alcatel OneTouch had a 4" ereader / smartphone accessory which was the talk of CES 2014, and today I finally managed to get my hands on it. This prototype, which is currently being called the MagicFlip, is a svelte 4" ereader with a USB port, page turn buttons, Bluetooth, and not much else. Like the E-ink smartphone cover which Alcatel teased back in September, this was a very early prototype which can't do very much. Of the 3 buttons on the front only the page turn buttons worked. There is a home button, but it didn't do anything. In fact, the device itself couldn't do much, but unlike Engadget, I was able to get the Magic Flip to work as an ereader - until it decided to rest itself. 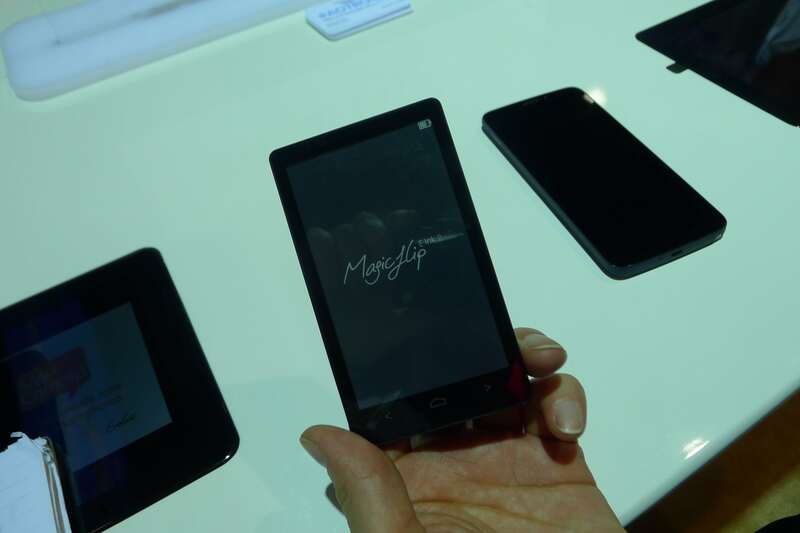 It can't do anything else yet, but i was told that Alcatel is planning to let you send info to the MagicFlip so you can use the paper-like qualities of the persistent E-ink screen, thus saving battery life on your smartphone or tablet. This was a really cool device, and I was frankly surprised at how small and thin it was. It could indeed be an excellent complement to a smartphone, even more so than the txtr beagle (a 5" ereader with a similar smartphone companion design). The MagicFlip is lacking the ungainly bulge found on the back of the txtr beagle, and that's going to make it a lot easier to slip this ereader in and out of a pocket. It's scheduled to go into production in the first quarter of this year; I don't know the retail price. It’s such bad design to have a tiny screen like that and then put big margins around the text. Why not make the device white and then the bezel can serve as the margins and the text can go from edge to edge of the screen?